The Power Link single pole connector series is designed for power distribution systems, offering the ultimate features in safety and reliability under the most severe operating conditions. Typical applications for Power Link include three-phase motors, generators, load banks and lighting distribution panels. Power Link connectors are also suitable for many other supply companies and heavy industry environments. Power Link connectors are designed and tested to comply with European and US electrical safety standards and specifications. Secondary locking: to prevent accidental disconnection Dead front contacts: insulated nylon tip on the live contact prevents accidental touching. High impact insulators: glass filled thermoplastic insulators prevent damage due to mis handling and guarantee a high degree of insulation, with maximum resistance to oil, acids and water. Multipoint contact: twentythree spring loaded active elements (louvers) allow low insertion force and guarantee multiple points of contact, ensuring minimal power loss. Integral Location Keys: each connector type is individually keyed to eliminate the possibility of accidental cross mating. Waterproof when mated: sealing is guaranteed through IP 67 rated interfacial and cable gland compression seals. Colour coded: insulators are supplied as standard colour identification codes. 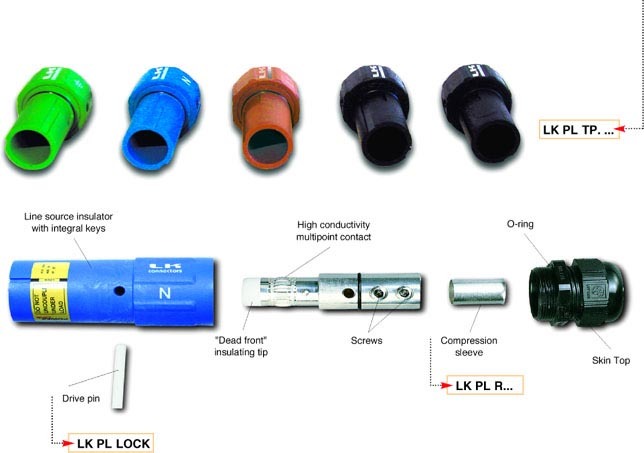 The Power Link connector series has permanent integral keys which prevent the accidental connection of dissimilar types (e.g. Earth and Line 1). Each connector type has a unique keyed position. Visual identification is made easily by means of the coloured insulators. The pin key to unlock the locking pin make possible to handle the connector and the key using only one hand. A full range of Power Link dust caps for male and female connectors in European standard colours is now available to protect your connectors when unmated.